Kuboth Cards - Set mit 25 Stück ​Holds a standard sized trading card Open on the short side Colored green border BCW 3x4 top loading card holders are made of high-quality, rigid PVC. These toploading holders are some of the most popular rigid individual card holders in the collectible card industry. Use this product to protect, store or display collectible baseball cards, football cards, hockey cards, or other trading cards like Magic The Gathering, Pokemon, YuGiOh, and others. 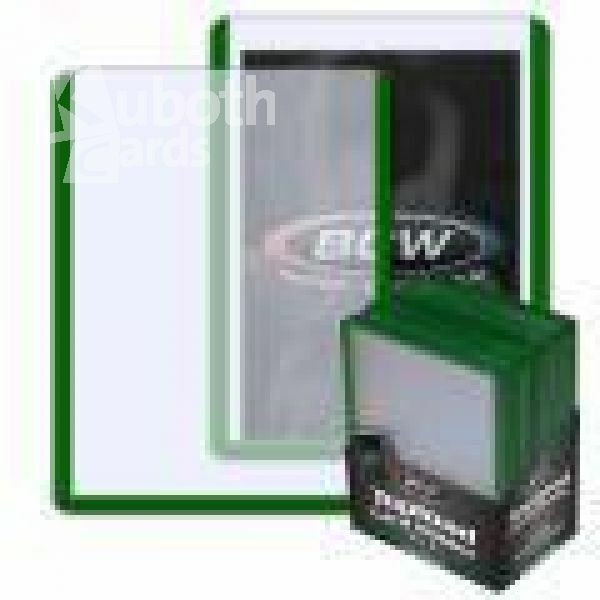 ​Holds a standard sized trading card Open on the short side Colored green border BCW 3x4 top loading card holders are made of high-quality, rigid PVC. These toploading holders are some of the most popular rigid individual card holders in the collectible card industry. Use this product to protect, store or display collectible baseball cards, football cards, hockey cards, or other trading cards like Magic The Gathering, Pokemon, YuGiOh, and others.